Religion has played an essential role in debates about refugee accommodation both as a justification for the expansion of refugee protections and as a motivation for fighting such accommodation. Yet the role of religion often goes unexamined as the modern nation-state has become the primary focus of advocacy regarding refugees and refugee policy. 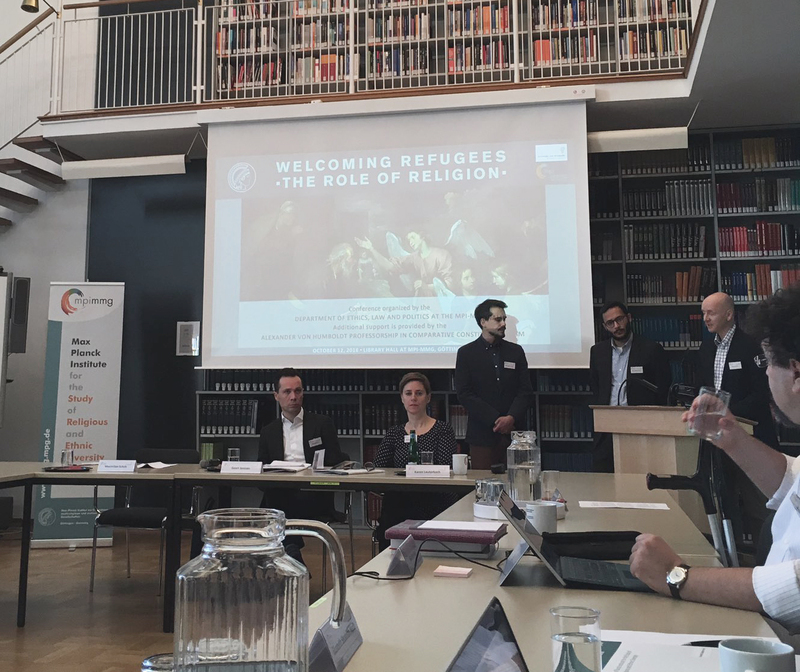 Over one day in Göttingen, “Welcoming Refugees: The Role of Religion” refocused attention on the centrality of religious justifications and religious organizations in the accommodation of refugees. Scholars from diverse disciplines scrutinized the relationship between religion and refugee accommodation in history, in contemporary society, and in political theory. The conference opened with a panel focused on refugee churches and their importance for facilitating the accommodation of newly displaced individuals. Dr. Geert Janssen (University of Amsterdam) began by guiding the conference participants back four centuries into the world of early modern Europe, when the word ‘refugee’ (réfugié) first emerged. Drawing on his archival research on Dutch, English, and French refugees in the sixteenth, seventeenth, and eighteenth centuries, Janssen showed how displaced religious communities began to call themselves and their persecuted coreligionists “refugees” in order to demonstrate that they deserved protection. Thus, the concept of the refugee in Europe emerged within the context of refugee churches as a way to advocate for the religiously persecuted. 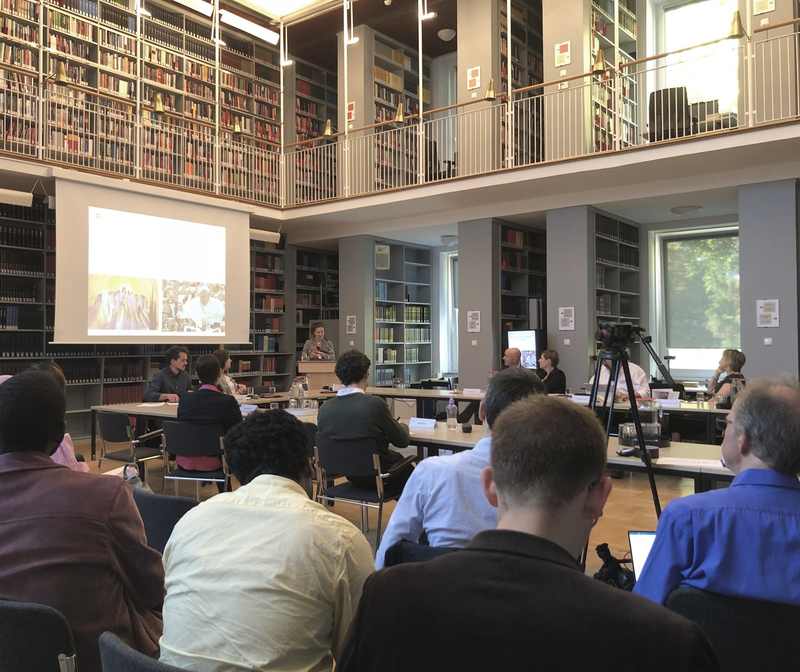 Dr. Karen Lauterbach (University of Copenhagen) then shared her research on refugee churches in present day Kampala, research which establishes unequivocally the continued centrality of refugee churches for the accommodation of displaced peoples. Examining a series of Pentecostal churches in Kampala and their efforts to shelter and provide for Congolese refugees, Lauterbach uncovered the deeply held religious convictions that inspired refugee pastors and refugee parishioners to welcome and feed newly arriving Congolese people. And although Lauterbach questioned the coherence and essentializing character of the term “refugee church,” she demonstrated beyond a doubt that religious communities of refugees were primary facilitators of refugee protection, irrespective of the religious affiliations of the newly arrived. The second panel of the day explored the theoretical dimensions of religious justifications for refugee accommodation. 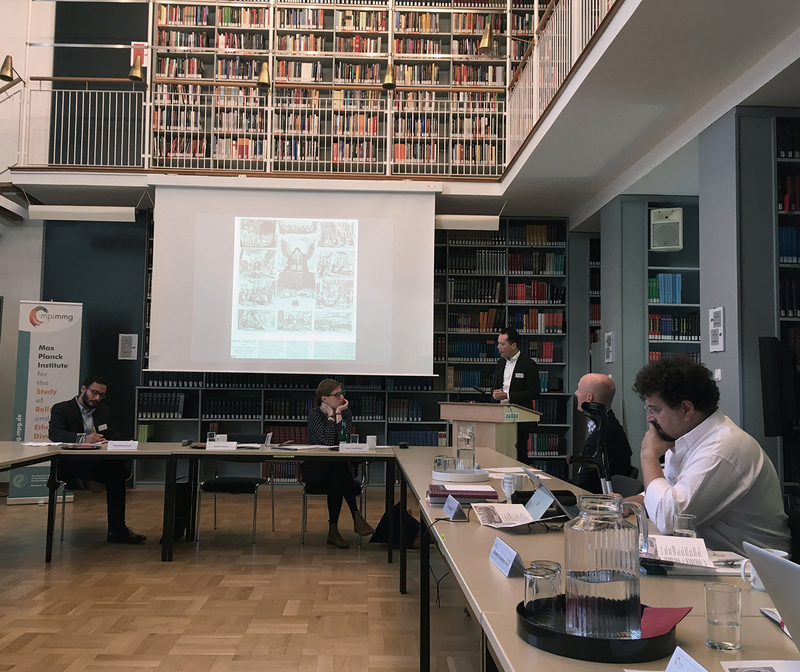 Dr. Aurélia Bardon (University of Konstanz) began the panel by posing the question: Does the Pope’s profoundly religious support for refugee accommodation contradict liberal public reason? Pope Francis’s support for refugee accommodation has earned him global praise from refugee advocates, even non-Catholic advocates. Bardon asked whether the Pope’s Catholic reasoning and Catholic audience should discredit his arguments from a liberal, Rawlsian perspective. She answered with a clear “No.” Her presentation revealed the profound overlap possible between religious reasoning and Rawlsian public reason. Bardon concluded by suggesting that the “familiarity” of religious arguments could make them particularly effective in advocating for the displaced. Dr. Sara Silvestri (City University of London) continued the panel’s focus on Pope Francis and his recent advocacy for refugees. Silvestri marshalled detailed historical evidence to prove that the papal curia had long advocated for refugee accommodation. Pope Francis was not the beginning of the story. Her study of Catholic advocacy then presented evidence—drawn from European and U.S. examples—of the practical and discursive ways in which Catholic leaders and NGOs have addressed the needs of refugees and the ways in which these efforts complement secular institutions and policy networks. Assessing these initiatives, Silvestri made the bold claim that Catholicism’s justification for refugee accommodation through moral values and political theology lends it a sui generis position within global conversations on displacement today, a claim which sparked a lively debate in the Q&A. Dr. Elena Fiddian-Qasmiyeh (University College London) delivered a keynote address titled “From the Local to the Global: The Roles of Local Faith Communities in Refugee Situations in the Global South.” She began by asking her audience: What is the position of local faith organizations and local communities in the conceptualizations, politics, and practices of refugee response? All too often, she argued, faith organization are either invisible, idealized, or instrumentalized. With her exciting new research on the roles played by faith organizations in six different countries, Fiddian-Qasmiyeh seeks to correct the picture. Her research reveals that many of the major assumptions about faith-based organizations are unfounded. For example, such organizations are not unsupportive of LGBTQI individuals—or at least they are no less supportive than non-religious NGOs. Suspicions of proselytizing, forced conversion, and patriarchalism are also unfounded, according to Fiddian-Qasmiyeh. Some refugee churches in Lebanon have even created shared religious spaces for multiple religious communities. It is important to note, Fiddian-Qasmiyeh reminded her audience, that faith-based organizations are largely composed of refugees themselves, who prioritize the furnishing of support to the recently displaced. Her research on faith-based refugee accommodation in the global south remains ongoing, and she hopes that her new emphasis on the stories of refugees supporting refugees will reduce current mistrust of faith-based support for refugees. Starting with the recent ruling by Israel’s supreme court that suspended the deportation of African migrants, Dr. Gilad Ben-Nun (University of Leipzig) traced the influence of Jewish religious thought on refugee law over the past century. The past hundred years have witnessed the implementation of a global legal framework protecting displaced individuals, with the 1951 United Nations Convention being the most important treaty protecting refugees. In the case of the Convention, as in many other instances, Jewish religious arguments helped frame the nature and scope of refugee protections enshrined in international and national law. Ben-Nun drew on his careful study of the personal archives of individuals like the jurist and historian Dr. Jacob Robinson to demonstrate how modern refugee protections have at their roots in Jewish religious prescriptions on hospitality and kindness. Dr. Irial Glynn (Leiden University) then explored the impact of Catholic thinking on recent Italian laws and norms surrounding refugees. 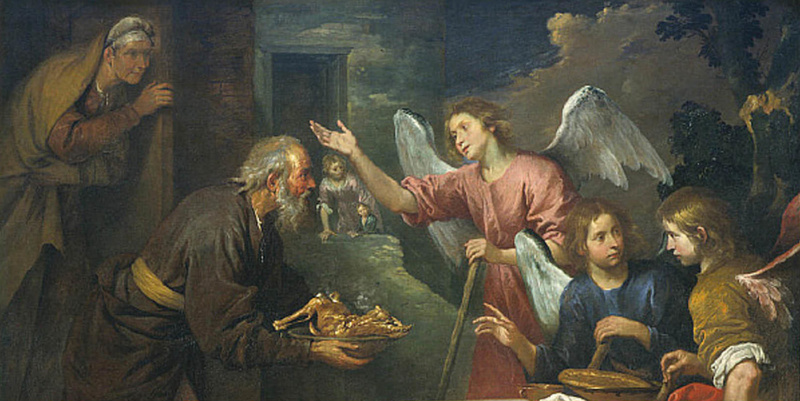 Positing that certain “moral entrepreneurs” have directly impacted Italian political conversation about refugees, Glynn connected such entrepreneurship to the Catholic Church directly. Both he and Ben-Nun uncovered the immense historical depth which religious arguments bring to refugee debates, a depth lost when discussing refugees in a purely cosmopolitan framework. The final panel of the day began with Dr. Diane Moore (Harvard University) summarizing some of the key characteristics of religion that animated the talks throughout the day. Moore echoed the other speakers in insisting that religion is diverse. As the other presenters made clear, religion is not a monolith standing in opposition to some abstract notion of secularism. Dr. Elizabeth Shakman Hurd (Northwestern University) concluded the conference with a provocative argument for a new legal standard for measuring asylum seekers’ claims of religious persecution. Hurd demonstrated how judges in the U.S. and Europe have moved away from the question of whether an asylum seeker is being persecuted for religion’s sake and instead now seek, mistakenly, to understand an asylum seeker’s “submerged religion.” Hurd laments this shift and proposes that judges discard the two failed approaches currently employed—1) the use of sincerity narratives and 2) the use of reformist narratives which examine an asylum seeker’s position within the eye of the persecutor. As neither legal measure works well, Hurd proposes a new approach, in which judges take seriously “the production of particular forms of acceptable religion” through the asylum application process. The three co-organizers—Drs. Benjamin Boudou, Hans Leaman, and Maximilian Scholz—concluded “Welcoming Refugees: The Role of Religion” by tracing three themes that emerged out of the many talks of the day. As the various presenters made abundantly clear, refugee accommodation is historical inseparable from religious efforts and arguments for such accommodation. Moreover, religious justifications and religious organizational support for refugee accommodation both overlap profoundly with non-religious efforts. Finally, religious arguments for refugee accommodation contain immense historical weight and incorporate appeals to familiarity which advocates for refugees would be wise to appreciate.